If you want the best White Laser treatment, you can easily find it in Clinic MF. We have developed a modern, efficient and practical laser treatment, and open up the doors to perfect and spotless skin in no time. The White Laser is also best known as the Q switch laser and it works by create a pulsed laser beam of higher peak power, which when focused on a certain skin condition will create heat and destroy diseased cells. It is designed to target pigment cells. 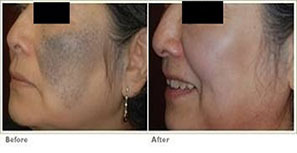 This treatment is designed for people on the go who want great, safe results, fast. How does White laser treatment work? Pigmentation – the laser energy is absorbed by the pigments (usually brown, or grey in colour). These pigmentation break off into smaller fragments and are naturally cleared away by the body and skin. Fairer skin – the colour of our skin is also determined by the amount of skin pigments. Darker skin people or people who go sun tanning often have more skin pigments. 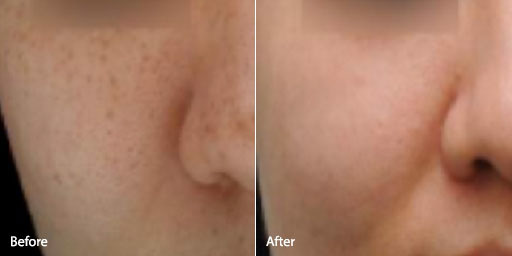 The laser, at the correct setting, helps lighten the skin tone and makes it fairer and brighter. Q-Switch Laser is often regarded as ‘Lunch-time’ treatment. Patients are able to continue daily activities post-treatment and wear makeup right after. It is advisable to avoid from the direct sun a minimum of 2 weeks post-laser treatment. Discolourations. During the treatment, the patient experiences a slight burning sensation. To prevent overheating of the epidermis and reduce the discomfort, various forms of cooling the skin are used during the treatment – cold gel, stream of cold air or chilled treatment head. Tattoos. To reduce the patient’s discomfort, the tattoo removal treatment is performed under local anaesthesia. In case of very large tattoos, the procedure may be performed in several stages, each comprising a different part of the tattoo. White Laser Treatment is a gentle alternative, and requires less sessions than skin resurfacing procedures to achieve similar results. Thus, reducing the chances of side effects greatly. It does not cause the skin to become thinner.